Something has been happening to the European startup scene in the last couple of years, and it is starting to manifest itself in an upswell of networking the likes of which I have not seen since I started blogging full time for TechCrunch way back in 2007. From the primordial soup of the developer community have sprung up events for startups, entrepreneurs and investors until, finally, last weekend Europe stumbled on the natural evolution of all this networking: an event which resembled and will perhahps come to rival The Lobby event in Hawaii. That’s an event where tech entrepreneurs gather to talk just amongst themselves for a change, and hang out. 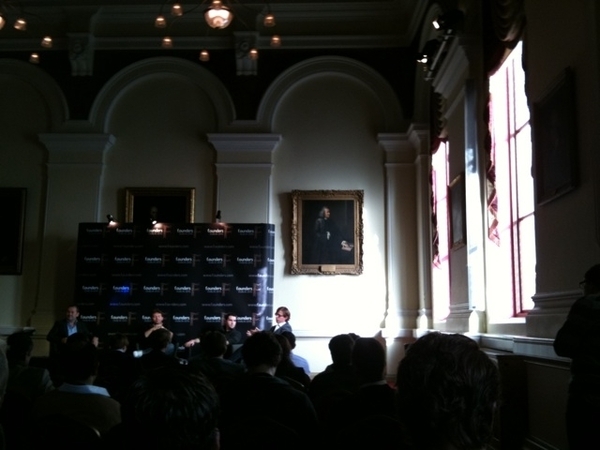 And that’s exactly what F.ounders, a new invite-only event in Dublin, did this past weekend. But let me unpack this trend. In the last few years a number of conferences have happened in Europe which make me say things like “My God, I think they are finally starting to get it,” to myself. After Loic Le Meur led the way with Les Blogs, which became the now vast Le Web, it seems every European country has wanted to have its own version. “Next” appeared in Berlin about four years ago. The Next Web in Amsterdam has gotten bigger and bigger and more international. Slush appeared in Helsinki last year. SIME recently revived it’s dotcom glory years for a new generation in Stockholm. GeeknRolla turned up in London. WhiteBull Summit launched. There are others. I’m now off to the Webrazzi Summit in Istanbul which again will have 800 or so attendees, like so mant others. And now TechCrunch France is planning it’s own event, Remix. In other words, there is a lot of activity now happening, and we’re barely into November’s conference season. In addition to which last week I attended IDCEE (Investor Day Central and Eastern Europe) an event which two years ago numbered 20 or 30 attendees in Kiev and focused on Russian, Ukrainian and Central European startups (of which more later). But this year organiser Denis Dopovoly, an affable figure who I would regularly bump into at TechCrunch US events, pulled out the stops with 700 attendees and numerous startups pitching. Granted, the likes of Laurent Gil, a cofounder of Viewdle, lambasted investors from the stage saying there were too few home-grown VCs and angels willing to back startups from the region in any kind of long term way. Viewdle was forced to travel to Silicon Valley for angel funding initially, but has since closed rounds from Best Buy and Blackberry Partners Fund. That said, at least 20 startups plied their wares in a startup alley reminiscient of TechCrunch Disrupt. I flew directly from there to the tail end of the Dublin Web Summit which has turned into a rolling event since Paddy Cosgrave started it only this year. This was the fourth event this year. It managed yet another 600 attendees, attending a range of tech sessions. And there was the weekend revelries of F.ounders, effectively an event within an event which focused on the Summit’s speakers and other invited startup founders. F.ounders event did exactly what it said on the tin: almost 95% founders, few investors and an extremely well oiled organisation of events to network everyone together. Unlike The Lobby unconference, this had a patchwork of panels, but in the main the event emphasised networking, socialising and, well, partying. Although I doubt I will match our own Erick Schonfeld just yet in the dancing stakes. As many attendees said to me privately: Almost no investors meant the entrepreneurs could compare notes, swap war stories and generally relax. I also saw no PRs and only two lawyers. In other words, heaven for entrepreneurs who can get pretty sick of having to feel like they are under pressure to perform all the time. Other highlights included a dinner sponsored by Skype founder Niklas Zennstrom, whiskey tasting (jameson’s of course), dinners, book signings, pub crawls and walking tours. Valley stars included Jack Dorsey of Twitter, Directi founder Divyank Turakhia, YouTube’s Chad Hurley and Bebo founder Michael Birch, ever the wittiest panelist at any event. Investors in the form of TechStars’ Tom Keller, Dave McClure, Jeff Clavier and Reshma Sohoni from Seedcamp were also there. McClure had a memorable moment when he told Irish investors and entrepreneurs “if any of you own a car that is worth more than $25K, you have money to invest. So invest, you pussies.” If they don’t, startups would just leave and head to the States he said. And he’s basically right. I’d like other investors to talk this way in London, Paris and Berlin, but as usual it seems an American like McClure has to call it out to some of these people. With what appeared to be a blank cheque from the Irish government, F.ounders, completely pulled out the stops for the attendees, such as handing out 12 year old bottles of Jameson’s with personalised labels (though not, I hasten to add, for me, but hey, it’s not like I’m bitter). But aside from those freebies, it’s clear that European entrepreneurs had at last found the event they’d all been waiting for: finding and talking to each other with no interruptions and everything facilitated for them to bond. When I walked into the room I realised the depth of research organiser Paddy Cosgrave had gone into to assemble such an amazing crowd. That quality of people meant that conversations were extremely high calibre. But there is one reality check that I am obliged to make if we’re to put this in perspective. Yes, the Irish government (including various politicians, local dignitaries, Enterprise Ireland and more) must have spent a packet. And yes, they kept emphasising Ireland’s low corporation tax. Indeed, this will make some startup CEOs contemplate moving their HQs to Ireland, perhaps when they are of a size that it makes sense to do so. However, although Ireland has a wealth of human talent and a great business environment, it will take more than this. And time and again I hear from home-grown Irish entrepreneurs that while the government is out wooing outside companies to base themselves in the Republic, the local entrepreneurs don’t always get quite the same red-carpet treatment. And without a much bigger pool of Dublin-based, local startups, engineers and VCs, the eco-system will not be able to run just on the entry of foreign companies alone. Consider this commenter’s points for instance from a previous post on Dublin. Dublin, and Ireland, need those young people coming out of universities to stay in the country and prevent the diaspora that happened during the recessionary early 90s. When the former Irish President, Mary Robinson appeared on a video talking about keeping “our young people” you knew that this was one of the underlying messages of F.ounders. Now, I’m not trying to inject sour grapes into what to all concerned was a seminal event – but simply point out that there is work to be done on Ireland’s eco-system that one event won’t fix. Having said that, the good-will that has been generated by F.ounders will go a very long way. It is not every day that you see Jolicloud founder Tariq Krim, a down-to-earth entrepreneur who has seen the worst and best of conferences and the startup scene, storm the stage with lots of people behind him, at the end of the final dinner, and announce that F.ounders was “the best event I’ve ever been to” and to raise a toast to Cosgrave and his team. They certainly deserve the credit.